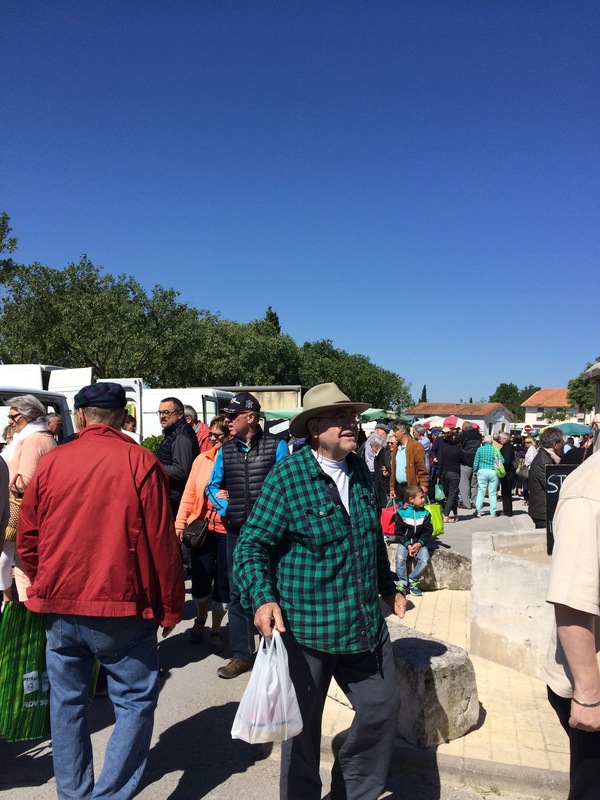 For a long time the only market we tended to go to on a Sunday was the massive event that packs the narrow streets and pretty squares of L’Isle Sur La Sorgue. 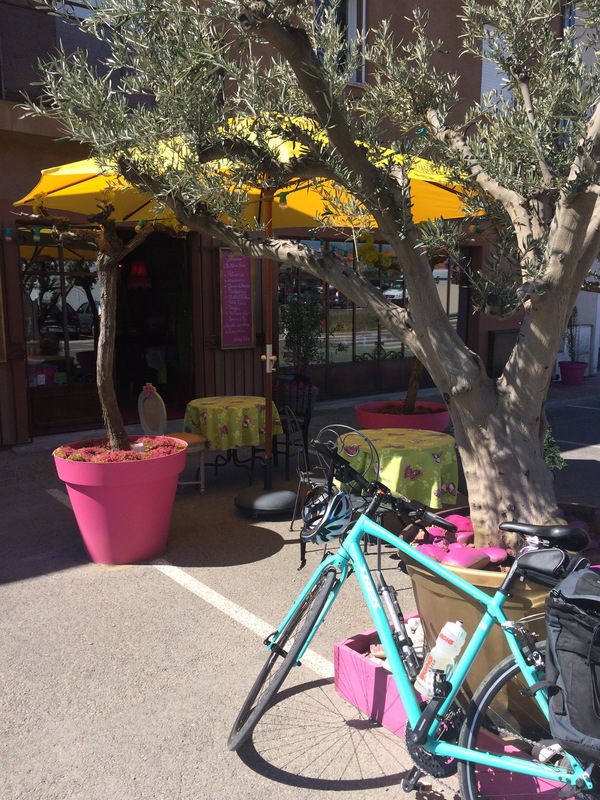 We would cycle in (early) and have breakfast at the wonderful Café de France, before wandering around the town browsing the huge number of traditional stalls & Brocante stands that line the streets. 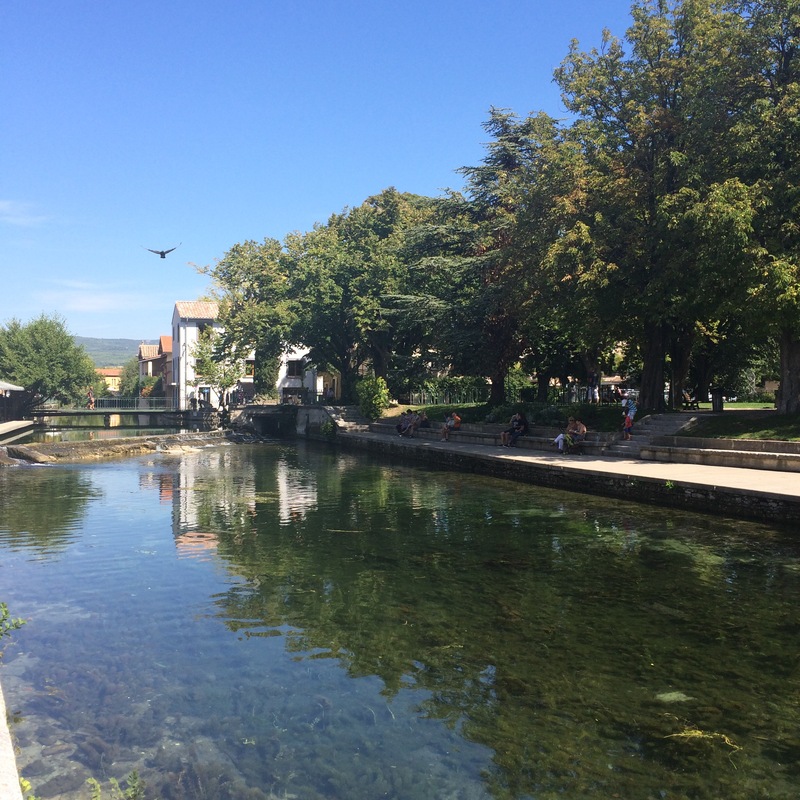 We would pack our panniers with food then cycle on to Fontaine de Vaucluse for a picnic by the river, before having a walk & cycling back. Recently though our Sunday morning routine has changed & whilst we still love Sundays there, we now often make our way instead to the market in Coustellet, which has a very different feel to it with lots of small, local producers selling from the back of their vehicles (more often than not an old white van) and even some Brocante stalls for me to nose around. 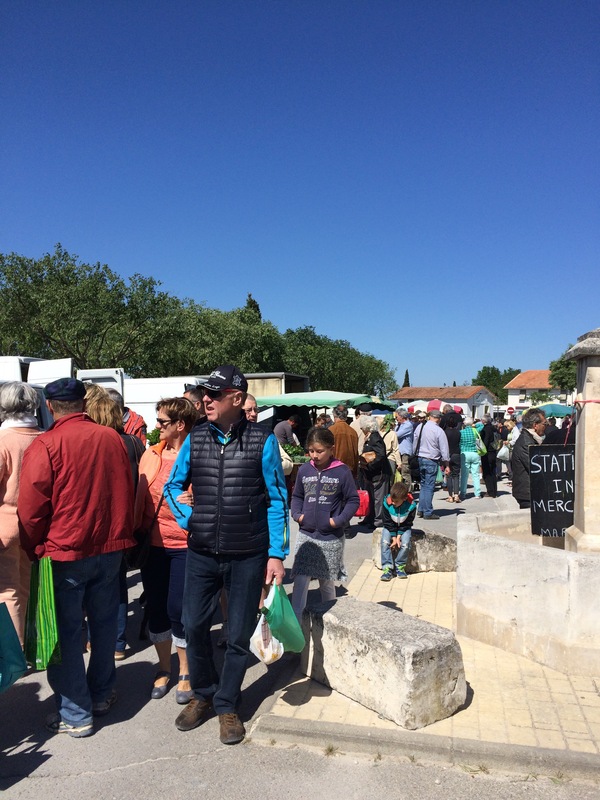 Coustellet market is set up in the car parks around the old station in the centre of the town and also across the main road up a side street that cuts through onto the main road that heads towards Gordes. It is on the Veloroute du Calavon so it’s easy to cycle there safely and there are plenty of places to park your bike. If you drive then many people park in the SuperU carpark or alternatively there are large car parks just off the Cavaillon road too. 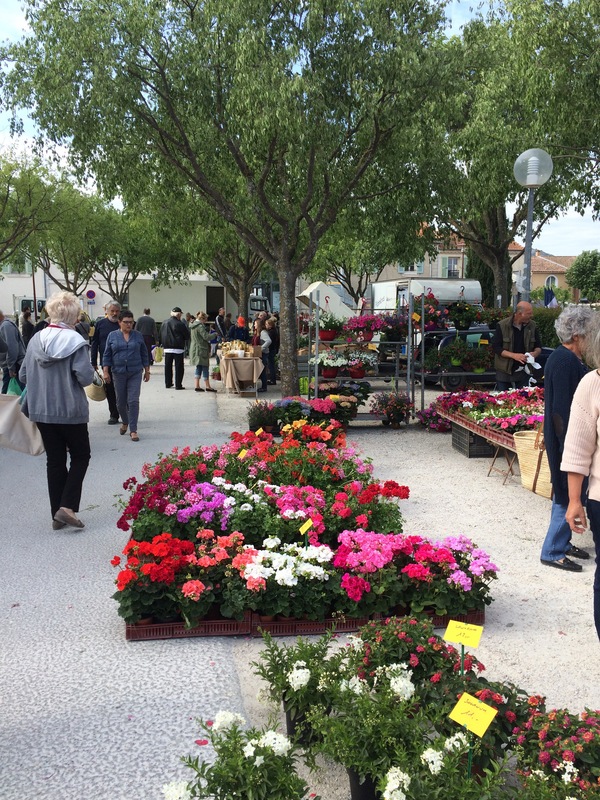 It may not be as picturesque a setting as L’Isle Sur La Sorgue, but it has a great atmosphere and the food on offer is seasonal, fresh and certainly draws in the crowds. The café in the old Station building in the centre of the market is a good place to stop for a coffee and watch the world pass by, usually to the sound of one of the musicians that sets up there. The farmers’ market itself is in the square between the old Station & the main road and is packed with local producers selling a wide range of locally grown or reared produce. It has a wonderful traditional feel to it and hasn’t changed much (apart from growing considerably in size) since we first visited it on the suggestion of Dommi (the owner of the camp site we were staying at) 25 years ago on a soggy (post-storm) morning. The produce on the stalls is fresh and looks wonderful, with everything from organic leaves and herbs (including sorrel, so great with fish) to a fresh poultry stall, which seems to have a never-ending queue whenever we’re there. 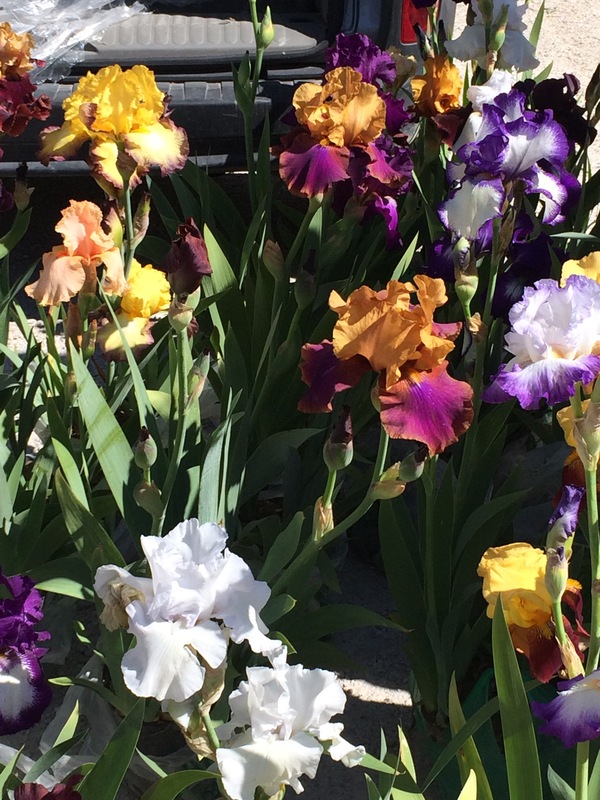 You can buy local wines and olive oil and fill your garden with ready-grown vegetable plants or stunning flowers. The produce changes as the seasons change and this time last week the first of the local cherries were starting to appear on the stalls along with the scented melons that are so firmly connected with the area. 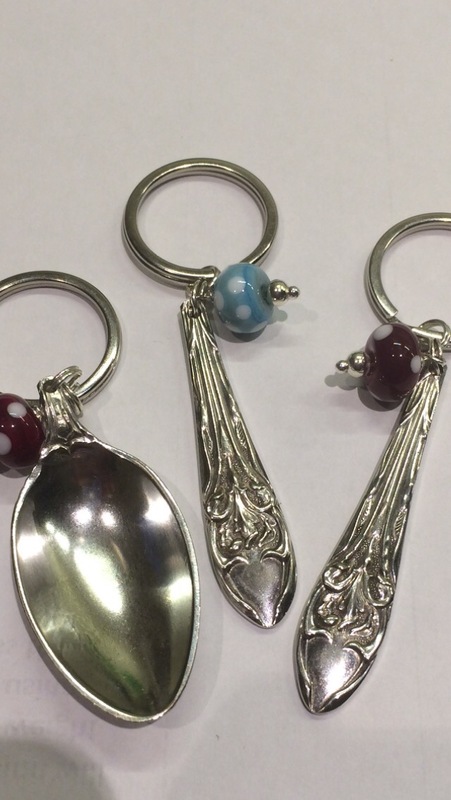 It certainly encourages you to eat healthily and also to eat with the seasons …. 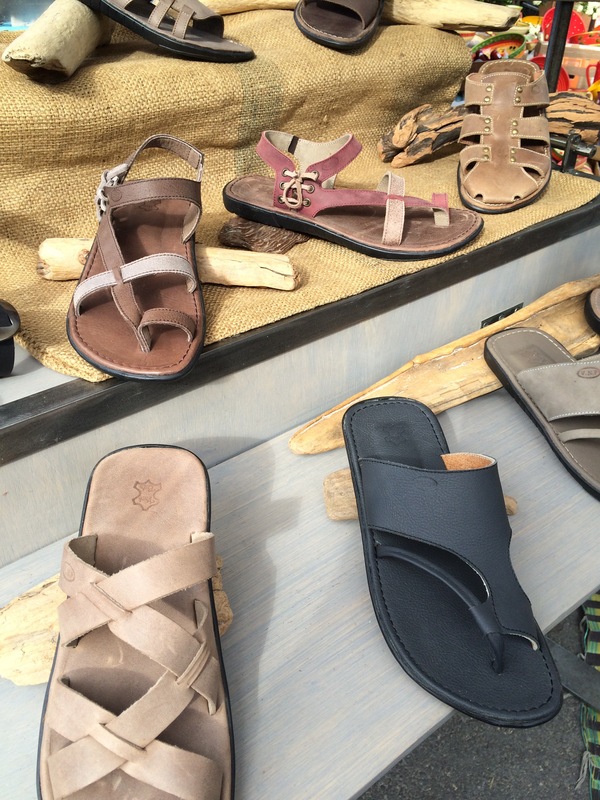 Here you can find incredibly comfortable & reasonably priced hand-made shoes, made by a chap from Uzès….. Finally if you need something a bit special to wear you can always pop into Agathezeluxe the shop on this walk-through that sells second-hand, top quality clothing and shoes (Dior, Chanel etc) https://m.facebook.com/Agathezeluxe.fr/ – I always look like an old bag-lady when I go in, but one day I’m sure I’ll need something a bit different & that will be a first point of call! 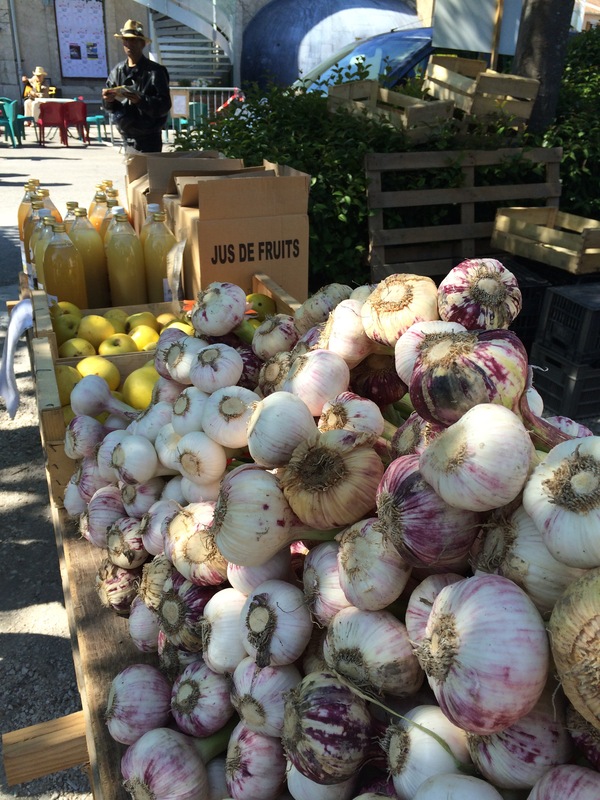 So our Sunday mornings have a new dimension – we can still cycle there & make a day of it, heading home via Gordes or Oppede Le Vieux, but at least our fridge will be filled with fresh local produce and I now know where to get that bit of Chanel I have always dreamed of ! Thanks – I live the markets so much – I eat so much better when I’m there thanks to the fantastic fruit & veg on offer – pleased you liked it. great photos and description – very inspiring! I love Coustellet Market! I also wrote about it in my Farmer’s markets series. It really does have some of the best produce! It was the only place I found beet greens last year (I have a minor obsession). 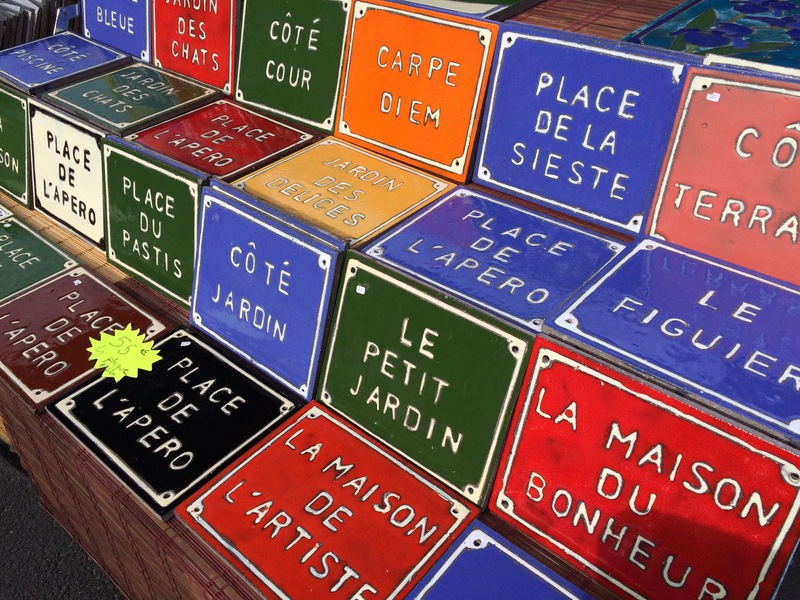 I always head to the markets in France. 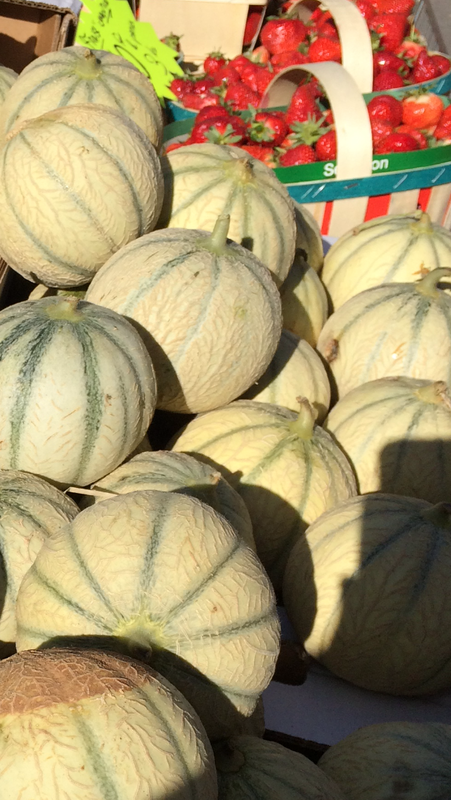 The produce is always amazing as I am sure the French hold onto all the best fruits and vegetables for themselves. Quite right too! I love those house signs. Tres chic! 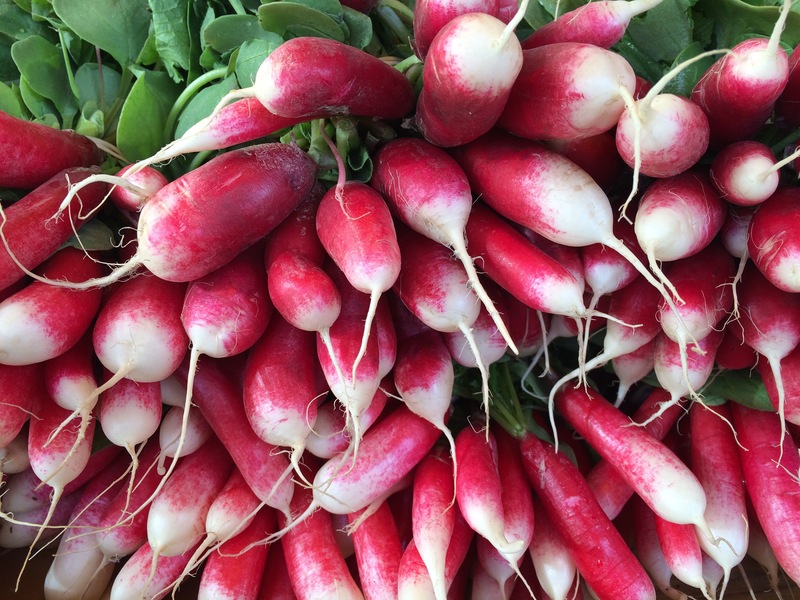 It’s as much for the visual feast as for the produce itself – thanks for conveying it so nicely! Thanks – as you say it’s so typically French! The nice thing is that you can only ever buy what’s in season – so it’s always locally grown, incredibly fresh & of course very tasty / as long as you don’t want a tomato in April!